The whole of Wall St.’s perpetual enrichment, at the expense of retail customers who get fleeced for outrageous fees for no good reason, is based on their driving the perception that investing is far too difficult and scary for you to do on your own. To that end, it spends over $10 billion a year in digital advertising alone, nurturing the illusion that they care about anything other than taking your money (wrong) and that you’re best off letting them manage your money (very, very wrong). Further, the vast majority of investment advisors and financial managers only invest in one direction: long. They are never going to tell you it’s a bad time to give them more money to invest for you. They will always be bullish on the market. Because they’re not investors. They’re just salesmen. And their job is to sell you on the lie that investing with them is a good idea. Because they want to make money, at your expense, much more than they care about protecting you from enormous losses in the coming crash. Don’t fall for the expensive suit, fake smile, and smooth talk. Take a step back. Look at the three charts below. Draw your own super-obvious conclusion about whether we’re in the midst of a massive bubble that is doomed to pop, and invest in real, perpetual stores of long term value. Is anyone actually dumb enough not to recognize these are bubbles? Of course not. 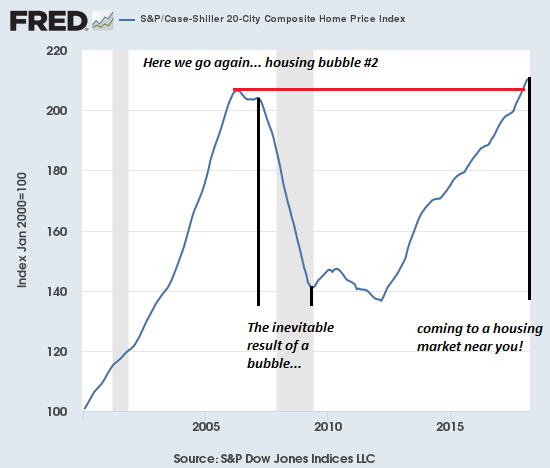 Those proclaiming that "these bubbles are not bubbles" know full well they're bubbles, but their livelihoods depend on public denial of this reality. And so we're inundated with justifications of bubble valuations, neatly bound with statistical mumbo-jumbo: forward earnings (better every day in every way! 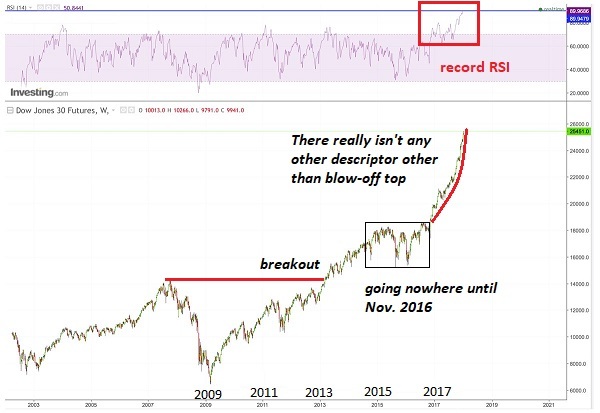 ), P-E expansion, and all the rest of the usual blather that's spewed by status quo commentators and fund managers at the top of every bubble. The problem with bubbles is they always pop. 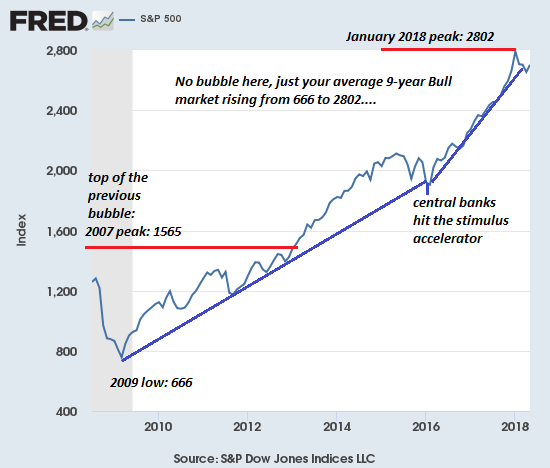 The market runs out of Greater Fools and/or creditworthy borrowers, and so sellers overwhelm the thinning ranks of buyers. Those dancing euphorically, expecting the music will never stop, are caught off guard (despite their confidence that they are far too clever to be caught by surprise), and the panic-driven crowd clogs the narrow exit, leaving a ballroom of bag-holders to absorb the losses.